This is the first game in the Bubble Bobble series. 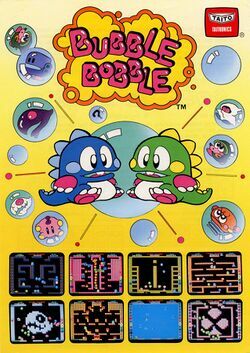 For other games in the series see the Bubble Bobble category. Bubble Bobble (バブルボブル, Baburu Boburu?) is an arcade game by Taito, first released in 1986 and later ported to numerous home computers and game consoles. The game, starring the twin Bubble Dragons Bub (Bubblun) (バブルン, Baburun?) and Bob (Bobblun) (ボブルン, Boburun? ), is an action-platform game in which players travel through one hundred different stages, busting and pushing bubbles, avoiding enemies and collecting a variety of items. The game became very popular and led to a long series of sequels and spin-offs. The main goal of the game is to rescue Bub and Bob's girlfriends from monsters. It is also notable for being an early example of a game with multiple endings, which depended on the player's skill and discovering secrets. In the game, each player controls one of the two Bubble Dragons, Bub and Bob. The player can move along platforms, as well as jump to those above and to the side, similar to most platform games. The dragons can blow bubbles. These can trap enemies, who are defeated if the bubble is then burst by the player's spiny back. The bubbles also float for a time before bursting, and can be jumped on, allowing access to otherwise inaccessible areas. Players progress to the next level once all enemies on the current level are defeated. Enemies turn "angry"—becoming pink-colored and moving faster—if they are the last enemy remaining, escape from a bubble after being left too long, or a certain amount of time has been spent on the current level. After a further time limit expires, an additional invincible enemy appears for each player, actively chasing them using only vertical and horizontal movements. Contact with enemies and their projectiles is deadly, resulting in the loss of a life. The popularity of Bubble Bobble led Taito (or its licensees) to port to many home computers and game consoles. Ports of the game were released for the Commodore 64, Sinclair ZX Spectrum, Amiga, Atari ST, MSX2, Amstrad CPC, Sharp X68000, PC (MS-DOS), Apple II, FM Towns, Sega Master System, Game Boy, Nintendo Entertainment System, Famicom Disk System, and Sega Game Gear. A version also exists for the BBC Micro as public domain though never officially released. The Sega Master System features two hundred stages. In 1996 Taito announced that they lost the original source code. As Probe Entertainment was in charge of the home conversions, Taito sent them a Bubble Bobble arcade board so they could play the original game and reproduce its mechanics. This led to the release of Bubble Bobble also featuring Rainbow Islands for Saturn, PlayStation and PC (MS-DOS) in 1996. In October 2005, a version was released for the Xbox, PlayStation 2, and PC as part of the Taito Legends compilation of classic arcade games. At the end of 2006 a new port for mobile phones in Europe and Japan was released. On December 31, 2007, the NES version of Bubble Bobble was released on Nintendo's Virtual Console service for the Wii. It costs 500 Wii Points. This page was last edited on 11 February 2013, at 17:22. This page has been accessed 56,536 times.